Breakeven analysis is used to determine when your business will be able to cover all its expenses and begin to make a profit. Breakeven Analysis is important to identify your startup costs, which will help you determine your sales revenue needed to pay ongoing business expenses. 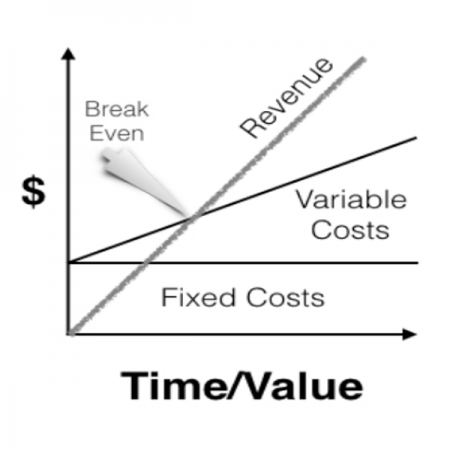 In the diagram to the right, note that as revenue increases, your variable costs (like raw materials or advertising) also go up. Of course you spend a lot of time worrying about fixed costs and especially if you are bootstrapping the business, but those variable costs can run away with you if you are not paying attention. Some spectacular early business failures can be attributed to growing too fast. The Kauffman Foundation and Inc. Magazine conducted a study of companies five to eight years after being featured on the magazine’s list of the 5,000 fastest-growing companies. Two-thirds of the companies had either shrunk in size, gone out of business, or been disadvantageously sold. What you can also do, using breakeven analysis is to determine, especially is the early days, how the numbers associated with each line over time are better or worse than predicted. Since you need to generate enough revenue at least to cover your costs to stay alive, your eye should be on positive cash flow, but this alone may mask whether you are headed towards profitability in the future. This added calculation will help you consider the relative contribution of particular products, which might otherwise be masked. and there are many other tools that will add to your ability to manage the process in the Tools section and in the Strategy section of Insights. Most helpful would probably be to read the eBook, Founders Stay Afloat—by tracking 25 vital facts and figures.